Unusual accommodations are among the choices available to travelers who seek a unique experience when it's time to check in and turn in. They range from ultimate luxury to basic bedrooms, from hotels on high, to underwater sleeping space. Here are some of our favorites from around the United States. Luxury style travel your thing? You can rent a plush penthouse located in the Mount Washington Valley of New Hampshire. It’s one of 16 themed quarters at the Adventure Suites complex along with a deserted island room where guests sleep in a giant oyster shell-shaped bed, a wine cellar suite which is any oenophile’s dream and a jungle hut complete with thatch roof, animal-shaped chairs and even a waterfall. Overnight guests at the Dog Bark Park Inn B&B in Cottonwood, Idaho (population under 1,000) enter a 30-foot-high beagle-shaped structure with sleeping arrangements for four people and the usual amenities found in many hotel rooms. Sweet Willy, as the inn is affectionately called by local residents, is a throwback to the kind of roadside architecture that was popular in the early days of automobile vacation travel. 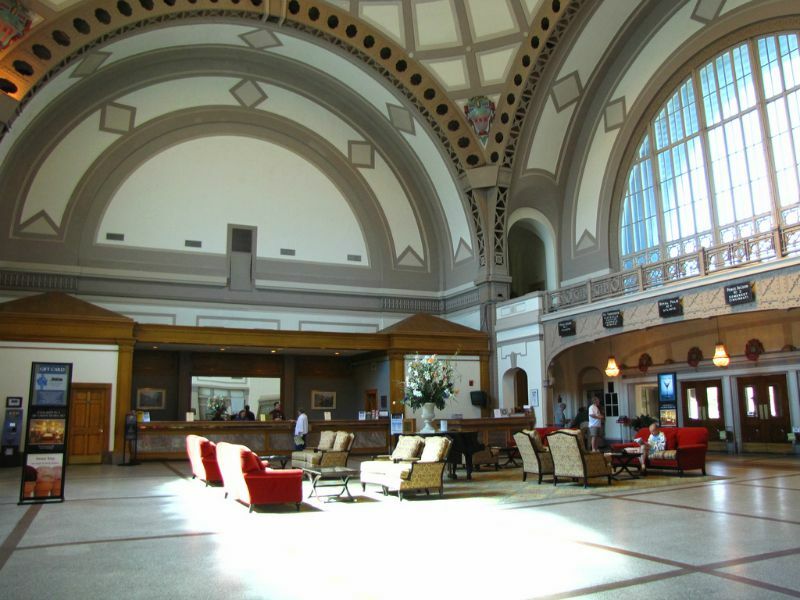 Train travel buffs who check into the Chattanooga Choo Choo Hotel will think they've gone to railroad heaven. The station in that city has been converted into a sprawling hotel complex with indoor and outdoor swimming pools, gardens and on-site shopping. In addition to standard hotel accommodations, guests may opt to sleep in one of 48 train car rooms. They realistically recapture the time a century ago when traveling across the country by railroad car was the height of luxury. The train rooms are lavishly decorated with Victorian furnishings, yet provide today’s modern conveniences. The accommodations are less luxurious, but equally as intriguing, aboard a World War II submarine which is moored along the shore of Lake Michigan. The USS Cobia was launched in 1943 and saw action in the Pacific theater, sinking a total of 13 enemy ships. Now part of the Wisconsin Maritime Museum, it’s available for day tours as well as overnight stays. Guests, who bring their own bedding, receive a guided tour which includes access to some areas of the sub closed to other visitors, and admission to the museum the following day. Those who prefer to rise above it all also have inviting alternatives. 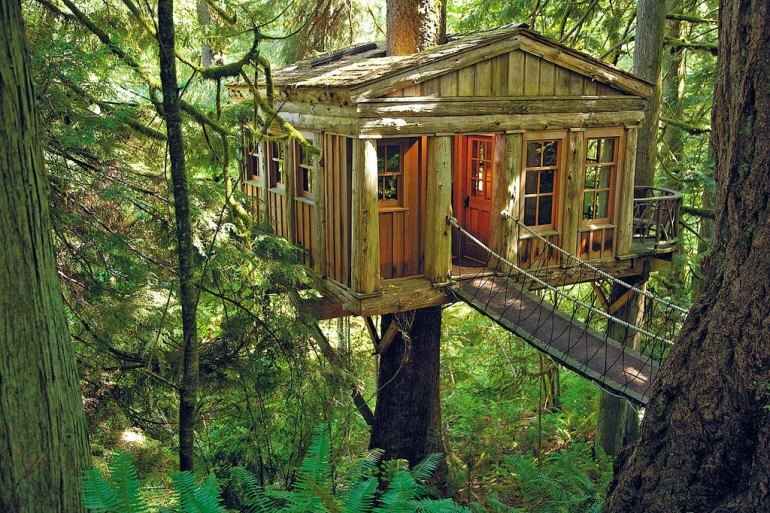 Some choose to recall fond childhood memories of playing in a tree house. TreeHouse Point, located in a lush forest a half-hour drive from Seattle, Washington, offers a selection of cabins perched above the aptly named Raging River. The property offers, and provides, a "personal encounter with the trees and nature." Guests access their hotel on high by way of stairs or a swinging walkway, and find cabins that are rustic but comfortably furnished. Another room with a view, the Jersey Jim Fire Lookout Tower, was built for a more serious purpose than playing in a tree house. It's one of hundreds of structures once located around the country from which forest rangers kept a lookout for fires, then relayed their reports by means of radio, carrier pigeon, and Morse Code messages spelled out by flashes of sunlight reflected in a mirror. Located in the San Juan National Forest in Colorado, the cabin sits 55 feet (and 70 steps) above a meadow at an elevation of almost 10,000 feet. Inside are the original furniture and ranger log book, along with propane-powered heating, lighting, refrigerator and oven. Although it's 20 feet shorter than the fire tower, the Rose Island Lighthouse offers an equally dramatic, if different, view. 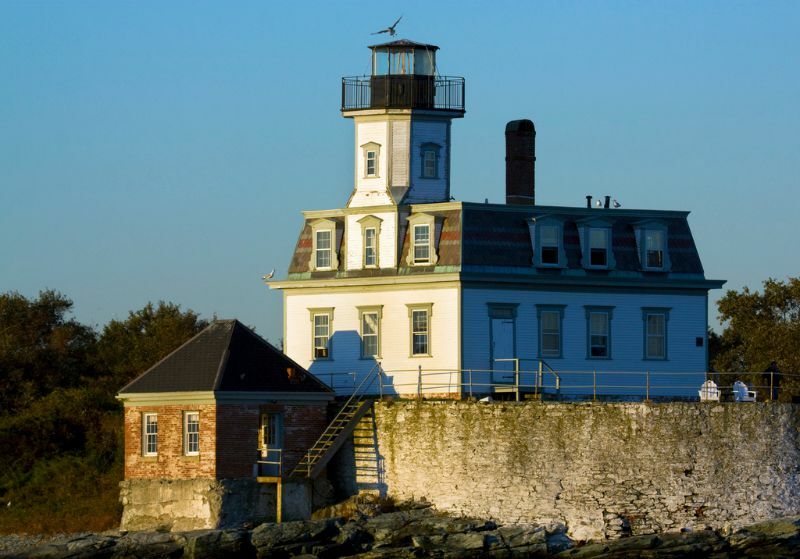 It's located in Narragansett Bay along the coast of Rhode Island. The base of the lighthouse is a museum which occupies rooms that have been restored as if keepers of old still lived there. In fact, it's possible to become a keeper, sort of, for a night or longer. Short-term guests agree to take care of a few chores like raising and lowering the flag and turning on the generator. Those who opt to become keeper for a week have additional responsibilities. After a one-hour orientation, they check the weather on the radio, record and manage the wind-powered electric and rainwater gathering systems, and see that the lighthouse is clean and presentable for day visitors. After completing their tasks, keepers are free to read, swim, gather sea glass, fish, use the kayaks or just take in the scenic setting from the top of the tower. As an added bonus, weekly keepers may claim some expenses, like travel and food, as a charitable donation. With rates that start at $280 a night, Kokopelli's Cave Bed & Breakfast in Farmington, New Mexico is no mere hole in the ground. Carved into a 65-million-year-old sandstone cliff face, and almost 1,700 square feet in size, the carpeted grotto includes a full kitchen and bathroom, television, DVD player with a selection of movies and other amenities not expected 70 feet below ground. The cave accommodates up to four guests and is reached by walking down a sloping path which includes steps cut into the rock. Another low down experience awaits guests at Jules Undersea Lodge. Originally built as an underwater research laboratory from which to explore the continental shelf, the mini-hotel sits on the floor of a mangrove lagoon at Key Largo, Florida. The living area includes two bedrooms and a common space that serves as galley, dining and entertainment room. The best entertainment is provided by the 42-inch round window in each room which looks out onto a nursery area for angel fish, parrot fish, barracuda, snapper and other reef fish. It's even possible to enjoy a meal prepared by a chef who dives down to the hotel and prepares a gourmet dinner. Non-divers receive a brief introductory course that allows them to access the lodge using scuba gear which is provided. Some accommodations appeal to folks seeking a less exotic place to spend a night or more. That certainly applies to the Shady Dell in Bisbee, Arizona, a former mining town about 90 miles southeast of Tucson. In 1927, it began to provide trailer and camping space for travelers along U.S. Route 80, which a year earlier had become the first all-weather coast-to-coast highway. 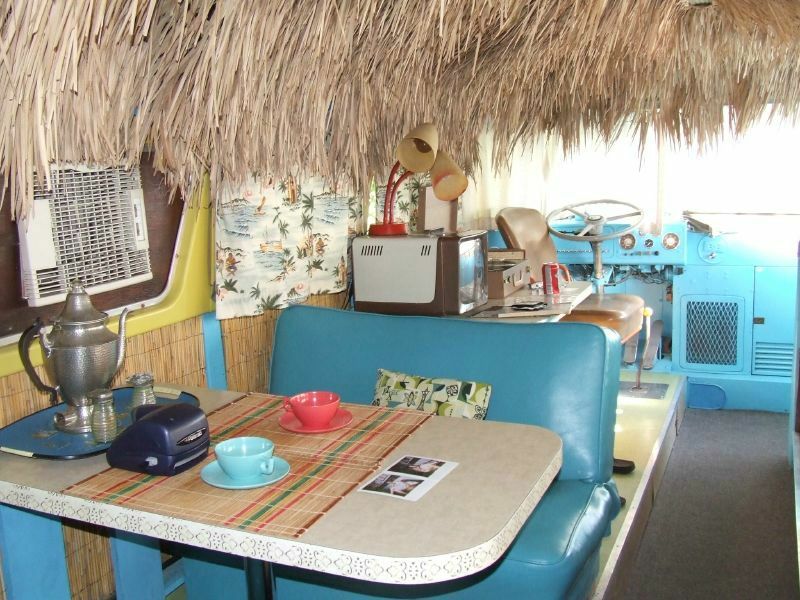 Today Shady Dell has 10 fully-furnished vintage trailers dating from 1947 along with a Christ Craft boat built in the same year. Several trailers have a toilet and sink, and group shower and bathroom facilities are available for the others. The word “basic” certainly applies to the ambiance of a home-away-from-home located the heart of the Mississippi Delta region, in a tin-roofed sharecropper cottage furnished in what is described as "a flea market lover's dream." The atmosphere at the colorfully named Shack Up Inn lives up, or perhaps down, to that moniker. Once guests get past the ramshackle outside appearance of the little houses, they find rooms that have been renovated to add electricity, plumbing, heat and air conditioning. However the mismatched furniture and dishes, walls adorned with old photographs and other period pieces embellish the theme. So do the Moon Pies which are the nighttime treat left on guests’ pillows in place of the usual turn-down chocolates. Have you stayed in one of these or another unusual accommodation? Let us know where and what you thought!